OVERLAND PARK, KS--(Marketwired - May 15, 2015) - The relationship between manufacturing and risk management is as old as the earliest industrial processes. Each stage of technological advancement in the evolution of manufacturing brings with it an ancillary dimension of risk. And while technological advancements are partly responsible for the increasing challenges of risk management, they are also the solution to managing and mitigating the manufacturing risks of today and tomorrow. A look back at the major events and periods of advancement over the last 300 years helps one gain a better perspective as to this progression. One of the earliest known forms of risk management in manufacturing dates to the late 18th century. During this period, artisans and skilled craftsmen formed associations called guilds to greatly reduce the risk of having their intellectual property stolen and ensuring the advancement of professional interests. This was an effective system based on the assets readily available. 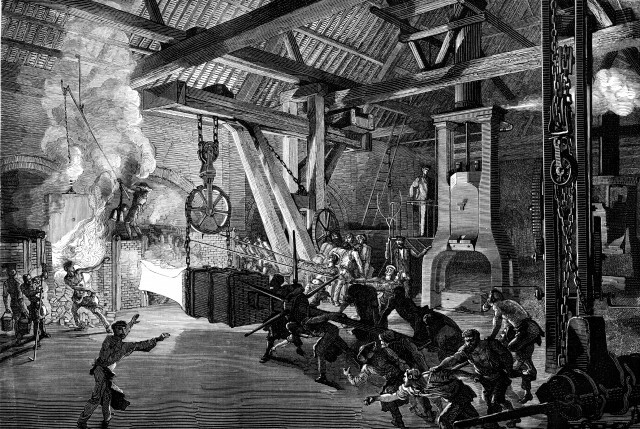 The dawning of the Industrial Revolution and factory systems at the turn of the 19th century rendered antiquated manufacturing methods obsolete and necessitated the implementation of large-scale risk management practices. Much like the guild systems of the past, unionized labor and newly imposed government regulations helped to mitigate many of the new risks associated with this new concept. Fast forward 100+ years to the 1960s. The introduction of computers automated many manual business operations and processes. The element of human error during production was greatly reduced, but new threats and risks that never existed began to rear their ugly head. With the birth of the Internet came instant global interconnection. Supply chains, channels, and customers were no longer limited to those within domestic boundaries. The Internet delivered increased coordination, communication, and integration both within companies, and abroad. But with global reciprocity came global risks, thus the adoption of new risk management strategies. The manufacturing sector is now beginning to usher in and reap the benefits from the newest development in this lineage of progression. The Internet of Things, or IoT, and cloud computing has officially introduced truly 'smart' manufacturing. With these new forms of information technology, inter-asset intelligence and communication has been actualized and made readily availability. Although this technology has resulted in autonomy from the human administration of monitoring, control, and optimization, its infusion has caused the manifestation of an entirely new dimension into the risk landscape. No longer are associated risks limited to 'local', internal assets, such as a facility, employees, or processes. Even to say that relevant risks are on a global level is still too limiting. With the development of this new arena in which business is conducted, organizations are having to adapt on the fly. However, as exemplified throughout history, it is these new forms of technology that will also help to ease the burden of adaptation. By employing next generation solutions, a risk landscape that was once considered cross-dimensional is now brought into a single scope. Governance, risk management, and compliance software (or GRC for short) does just that. These solutions, including LockPath's Keylight platform, can tackle both the quantitative and qualitative tasks associated with risk measurement. A robust GRC tool can effectively identify and document risks, assign a value to each, and prioritize identified risks by appointed values or predetermined business impact. All of these functions combine to provide an in-depth view of enterprise-wide risk analysis, with the end benefit being governed, strategic risk mitigation. Manufacturing is, yet again, experiencing a paradigm shift. Risk management is no longer a one dimensional field. The anatomy of such is even more complex when taking into consideration the interweaving of compliance, business continuity planning, and information security. Just as it has been in the past, organizations must continuously adapt to survive. By effectively managing risk mitigation strategies through the harmonious integration of new technologies, such as a GRC solution, companies can flourish in this new era of risk management. While technological advancements are partly responsible for the increasing challenges of risk management, they are also the solution to managing and mitigating the manufacturing risks of today and tomorrow.